Alberta’s oil sands facilities are gearing up to launch innovative projects that will reduce emissions, create new jobs and enhance competitiveness. 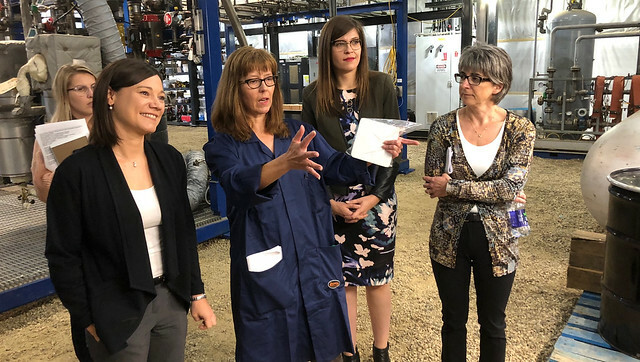 L-R: Minister Shannon Phillips, Lisa Doig, MLA Jessica Littlewood and Lorraine Mitchelmore discuss the reactor process at the plant site in Fort Saskatchewan. Nine Alberta oil sands technologies will receive more than $70 million through the Oil Sands Innovation Challenge to support economic growth in the oil sands sector. The funds are provided by the Alberta government through Emissions Reduction Alberta (ERA), an organization that accelerates the development and demonstration of innovative, emissions-reducing technologies. The funding leverages a combined project value of more than $720 million for Alberta’s oil sands sector. This is ERA’s biggest challenge to date in terms of funding. In total, 47 projects were submitted including field pilots, commercial demonstrations and first-of-a-kind commercial technology with the potential for substantial greenhouse gas reductions in retrofit and new-build oil sands operations. Selections were made based on the ability to advance innovative technology solutions to delivery, greenhouse gas emissions reductions and cost competitiveness enhancements. All projects include a major oil sands producer as the lead applicant or as a substantial partner and all field demonstrations are required to occur at an Alberta oil sands site. These projects will help Alberta’s oil sands industry meet the provincial climate leadership oil sands legislated emissions limit of 100 megatonnes by 2030. The projects are estimated to result in potential greenhouse gas emissions reductions of up to 4.1 million tonnes of annual CO2 emissions reductions in Alberta by 2030. This is equivalent to more than 440,000 homes’ energy use for one year. The Alberta government provides grants to ERA from the Climate Change and Emissions Management Fund. These funds support innovation and Alberta’s industry leaders to create new jobs, diversify the economy and reduce carbon emissions. To date, ERA has committed more than $385 million in funding to 129 projects with a total value of approximately $2.7 billion. This challenge aligns with the Carbon Competitiveness Incentives System (CCIs) that is expected to cut emissions by 20 million tonnes by 2020 and 50 million tonnes by 2030. The CCIs will reduce emissions, attract investment, and grow the modern Alberta economy. This made-in-Alberta solution protects our businesses by reducing costs for sectors that are reliant on exports, keeping their products competitively priced in international markets.